Some members of Detroit’s activist community are concerned about the future of the Charles H. Wright Museum of African American History. They want more grassroots community representation on the museum’s board, and a voice in selecting its new permanent leader. They also object to a planned exhibition about life on Thomas Jefferson’s Monticello plantation during Black History Month. The Coalition for Black Legacy at the Charles H. Wright Museum outlined its issues with the museum's direction and leadership Wednesday. Abdul Aquil is with the Coalition for Black Legacy at the Wright Museum, and the Association for the Study of Classical African Civilizations. He says most current board members have corporate affiliations, and don’t have roots in Detroit’s marginalized or African-centered communities. “And I’m understanding that one of the criteria of them being a board member is the ability to raise funds. Well, that excludes a large portion of the African American community right there,” Aquil said. House says coalition members are concerned about a possible shift away from the “insightful programming” the museum offered under former CEO Juanita Moore, who left the Wright earlier this year. House says a request to put more community representatives on the search committee for a new, permanent CEO was swiftly denied by museum leaders. Coalition members also spoke at length about their objections to a planned exhibition called “Paradox of Liberty,” which examines the lives of enslaved people at Monticello, Thomas Jefferson’s Virginia plantation. House called the exhibit “totally inappropriate." 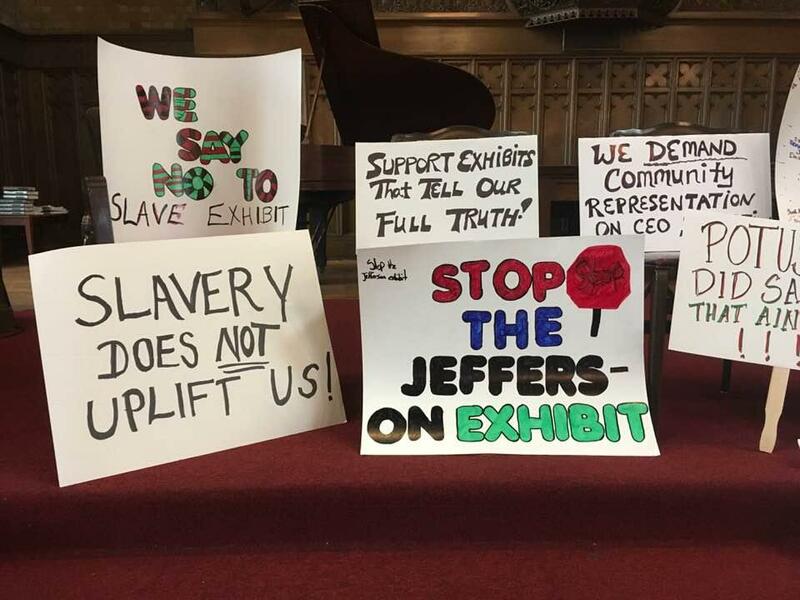 “It seems highly insensitive, in this particular political climate with the rise of open white supremacy, to--during Black History Month--propose an exhibition that somehow tries to recast the history of the Jefferson plantation,” said House. House and other coalition members are especially outraged about its depiction of Jefferson’s relationship with a slave, Sally Hemings. It’s now widely acknowledged that Jefferson fathered at least some of Hemings’ children. But Wright Museum spokeswoman Delisha Upshaw says plans for the Paradox of Liberty exhibit began under former CEO Moore’s leadership. “It's a powerful exhibit that tells the story of Sally Hemings and other families who were enslaved at the Monticello Plantation - from their perspective,” Upshaw said in a written statement. “We're proud to work with Gayle Jessup White, a Hemings and Jefferson family descendant, to tell the important, often forgotten stories about these families, their tremendous contributions to our country, and their legacies that live on today." Today’s show was broadcast from the Charles H. Wright Museum of African American History. Dr. Charles H. Wright was a physician, a gynecologist and obstetrician. Through the years he delivered 7,000 babies in Detroit alone. He also founded the museum in his office by first collecting small items. The 22,000-square-foot museum holds the largest exhibit dedicated to the history of African Americans. Stateside's Cynthia Canty spoke with curator Patrina Chatman. An interview with Bob Smith of the Charles H. Wright Museum of African American History and director Kate Mendeloff. One of the most painful and divisive times in Michigan's history were the five days in July 1967 known as "the Detroit riots," which left 43 people dead, nearly 1,200 hurt, more than 2,000 buildings destroyed and more than 7,200 people arrested. One of the most infamous events of those five days came just after midnight on July 25, 1967. The riots were at their peak when Detroit police and National Guard troops swept into the Algiers Motel, searching for snipers. Two hours later, police left the Algiers. They had found no snipers. But they left behind them the bodies of three black youths. The Algiers Motel incident is the subject of a play by Detroit native Mercilee Jenkins: "Spirit of Detroit," a play about the '67 riot/rebellion." It will soon be presented at the Charles H. Wright Museum of African American History. Bob Smith of the Museum, and the director of the play, Kate Mendeloff, who is a theatre professor and director from the University of Michigan Residential College, joined us today. Events in Washington Monday honored President Obama’s inauguration, and the Martin Luther King Day holiday. The two events also meshed at Detroit’s Charles H. Wright Museum of African American History, where a few dozen people came to the Wright Museum to watch a live broadcast of President Obama’s second inauguration.